Ewart Parkinson who sadly died on 9 March 2015 was highly influential in the planning and the civic movement in Wales. He was also a kind and generous friend and mentor to many. The below article is reproduced with the kind permission of its author Bryan Johnson. It was first published on www.planningresource.co.uk on March 13 2015. Throughout his career, Ewart promoted planning as a creative industry that encompasses democratic and inclusive values. He urged and expected planners to understand communities’ goals and social needs so that they could meet their objectives. He believed firmly that planners serve society in managing change to improve the quality of urban and rural life. Ewart left school at 16 to start work at Leicester City Council, earning his initial qualification as a civil engineer through night school studies. From 1948 to 1964, he held local government posts as assistant engineer in Wakefield, principal engineer in Bristol, chief assistant engineer and planner in Dover, deputy borough engineer and surveyor in Chelmsford and deputy city surveyor in Plymouth. In 1964, he was appointed as Cardiff’s first city planning officer with a brief to seek the city’s economic and physical regeneration. Ten years later, he became director of environment and planning at the newly formed South Glamorgan County Council, bringing a cross-disciplinary and strategic approach to planning, regeneration, transport and land policy. During those two decades, he played a key role in projects and strategies that shaped Cardiff today. His proudest achievements included the central area redevelopment and pedestrianisation of Queen Street, the new County Hall which helped kick-start regeneration in Cardiff Bay, the M4 motorway section and Peripheral Distributor Road encircling the city, the Barry Docks Link Road, the Central Bus Station, the National Sports Centre, urban extensions at Pentwyn and St Mellons and the Cosmeston Lakes Country Park. After leaving local government in 1985, Ewart embarked on a second career as a development adviser, working alongside the Atkins and Hyder consultancies on projects across Wales and south-west England. He led the concept team for Cardiff’s Millennium Stadium, delivered on time for the 1999 Rugby World Cup, and advised the Millennium Commission on the National Botanic Garden for Wales. 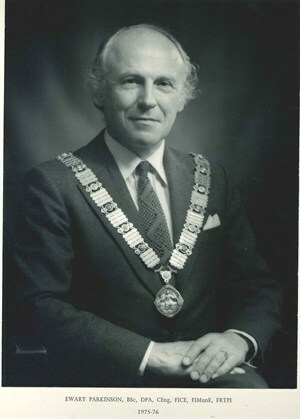 Ewart was active in RTPI circles, serving as South Wales branch chairman in 1970 and as national president in 1975/76. In 2004 he became only the second recipient, following Professor Nathaniel Litchfield, of the RTPI’s lifetime achievement award for his significant and exceptional contribution to planning. He was also founder chairman of the County Planning Officers Society in Wales in 1973. Ewart was an enthusiastic advocate of closer links between UK and overseas planning practice. He chaired the RTPI’s international affairs board and third world panel from 1976 to 1983 and was an honorary life member of the International Federation for Housing and Planning. He joined the UK delegation to the 1976 United Nations Conference on Human Settlements in Vancouver. From 1977 onwards, he led RTPI study tours to the Soviet Union, Africa, India and Bangladesh and China. 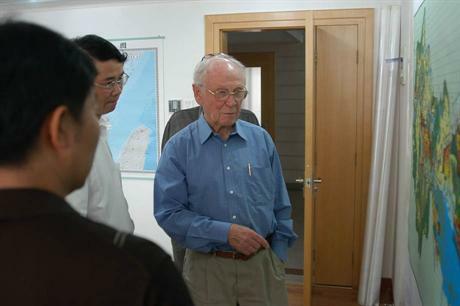 In the 1980s, he forged close links with the China Academy for Urban Planning and Design, ultimately making 14 trips to China to advise on managing change in cities such as Xiamen, Nanjing, Zhangzhou, Huzhou and the island of Hainan. Ewart gave his time generously to a host of causes and groups in his beloved adopted homeland of Wales. At various times he chaired the Facilities Committee of the Sports Council for Wales, the STAR Community Trust, the Wales Sports Council for the Disabled Trust and the South Glamorgan Council of Voluntary Service. He was chairman and president of the Norwegian Church Preservation Trust, receiving the St Olav Medal from the Norwegian ambassador in 2004 for his contribution to strengthening cultural ties between Wales and Norway. He served as a director of the Roald Dahl Arts Project Trust, now the Brainwave Project Trust; as founder trustee of Cardiff Action for the Single Homeless, now the Huggard Trust; as vice-president of the Wales Council for the Disabled; as patron of the Touch Trust; and as president of Cardiff Civic Society. He was awarded an OBE for voluntary and community service to Cardiff in the 2015 new year honours list. Ewart disseminated his experience and knowledge globally through award-winning papers, lectures and as a mentor and external examiner. Many leading planners in Wales and beyond acknowledge his formative influence in their careers. His passion and support for the profession has been evident throughout his career. Amid all his commitments Ewart always found time to support colleagues, family members and a wide circle of friends. We will all miss his advice and encouragement. He is survived by his wife Pat, two sons, a daughter, seven grandchildren and three great-grandchildren.